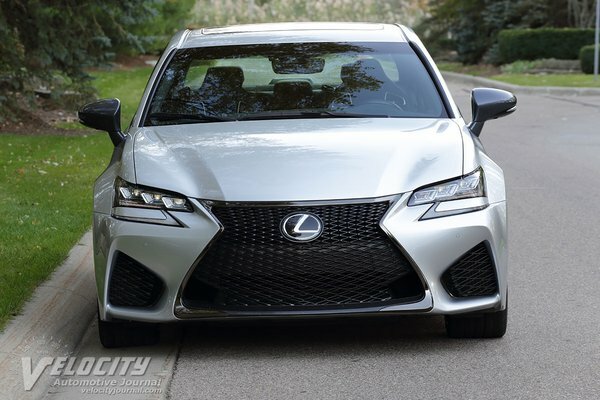 Within the Lexus sedan lineup, the GS fits between the compact IS sedan and below the luxurious LS500 at the top. The model range starts with the rear-drive GS 300 ($46,510) and ranges up to the GS F ($84,350). 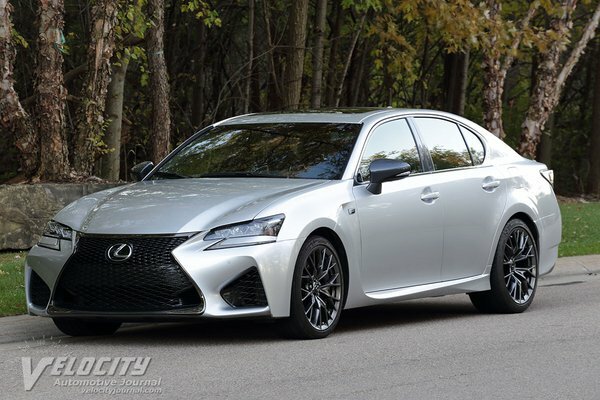 Both the GS 300 and GS 350 can be ordered with an F Sport package, but only the GS 350 is available with AWD. We tested a GS F with the optional 17-speaker Mark Levinson audio system ($1,350). Including the $995 delivery fee, the total MSRP added up to $86,725. Notable standard equipment includes a 12.3" touchscreen with navigation, moonroof, head-up display, dynamic radar cruise control, lane departure warning, carbon fiber rear spoiler, power folding mirrors, and LED headlamps. 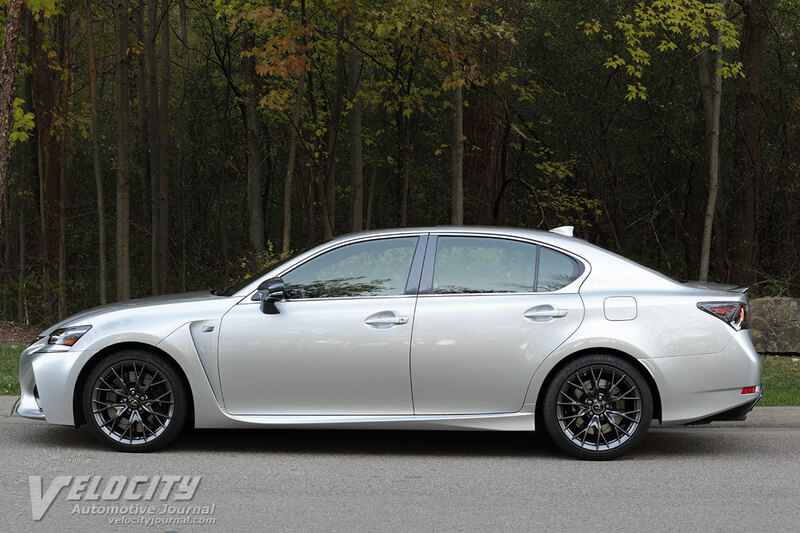 Lexus offers the GS with two engines: a 241-hp 2.0L turbo four (GS 300), or a 311-hp 3.5L V-6 (GS 350). For the GS F, Lexus fits a 5.0L V-8 under the hood cranking out 467-hp @ 7,100 RPM, and a generous 389 lb.-ft. of torque between 4,800 and 5,600 RPM. This DOHC all-aluminum V-8 has both electrically and hydraulically-actuated variable valve-timing so it can switch between the efficient Atkinson Cycle and the Otto Cycle combustion modes. Redline is an impressive 7,300 RPM, aided by forged connecting rods and titanium valves. The fuel injection system uses port and direct-injection. All GS models are with an 8-speed automatic. The GS F automatic with overdrive seventh (0.824:1) and eighth (0.685:1) gear ratios; the axle ratio is a relative tall 2.937:1. 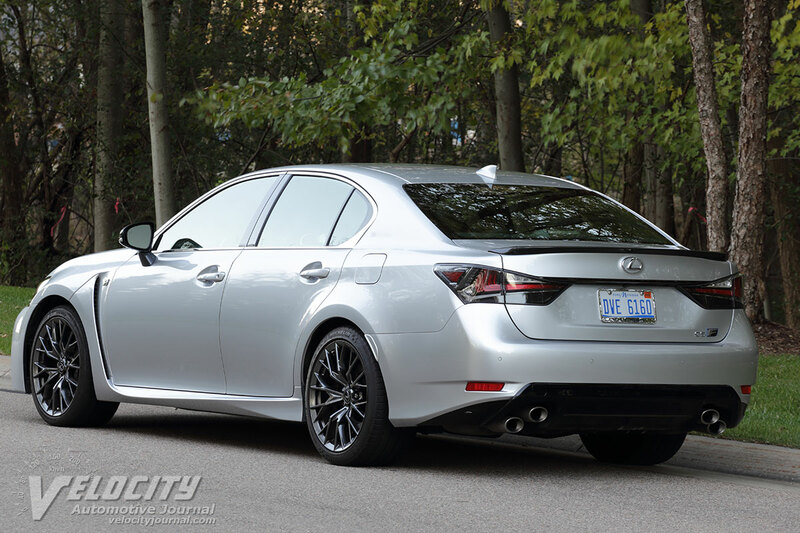 Lexus claims the 0-60 MPH sprint takes just 4.5 seconds, followed by the � mile in 12.5 seconds. 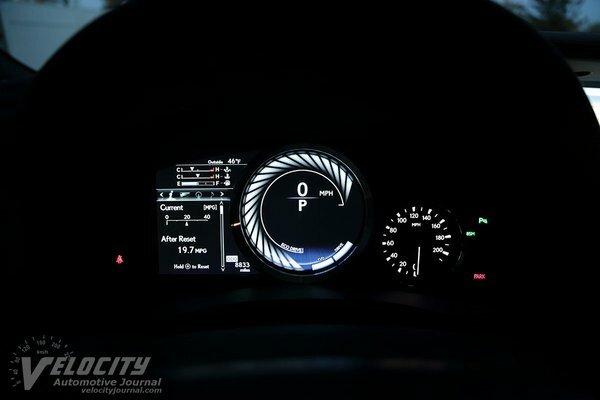 Top speed is limited to 168 MPH. Fuel consumption is rated at 16/24 MPG (city/hwy.). We averaged 19 MPG in mixed city and highway driving. 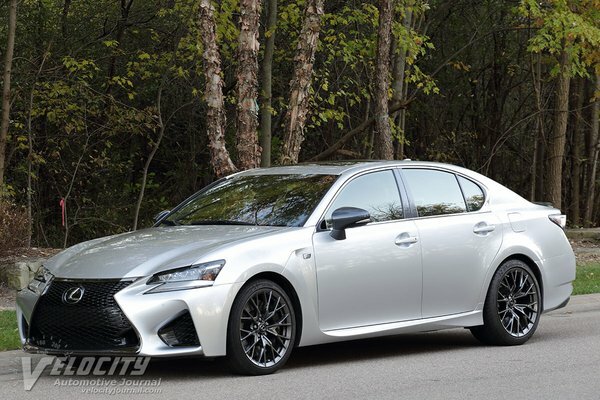 The GS F front suspension uses forged aluminum double wishbone control arms with coil springs, dampers and a tubular stabilizer bar. At the rear is a multi-link setup with forged aluminum control arms with coil springs and dampers. Adaptive Sachs dampers enhance handling and ride. An upgraded brake system includes 6-piston front and 4-piston monoblock calipers from Brembo. Optional orange calipers are available. 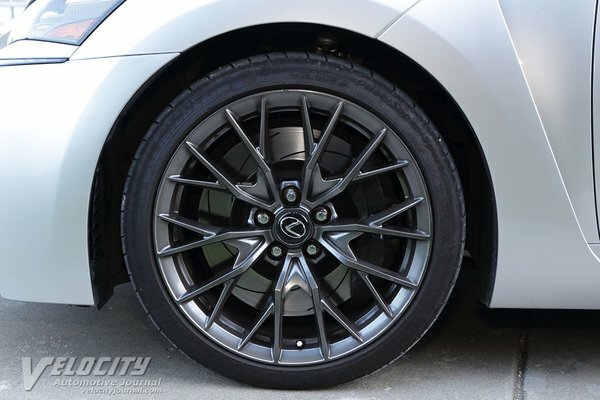 Vented rotors are at all four wheels: 15.0" dia. (front) and 13.6" dia. (rear). Michelin Pilot Super Sport 255/35ZR19 (front) and 275/35ZR10 summer tires are mounted on hand-polished BBS forged alloy wheels: 19" x 9" (front) and 19" x 10" (rear). A Torque Vectoring Differential (TVD) allocates rear wheel torque based on the driving mode selected (Normal, Sport, Sport+). An enhanced Vehicle Dynamics Management system (VDIM) with Sport and Expert modes is tuned specifically for the GS F. Steering is via a speed-sensing electrically-assisted rack-and-pinion system with 2.84 turns lock-to-lock. Curb weight is 4,034 lbs. distributed 53/47 front/rear. 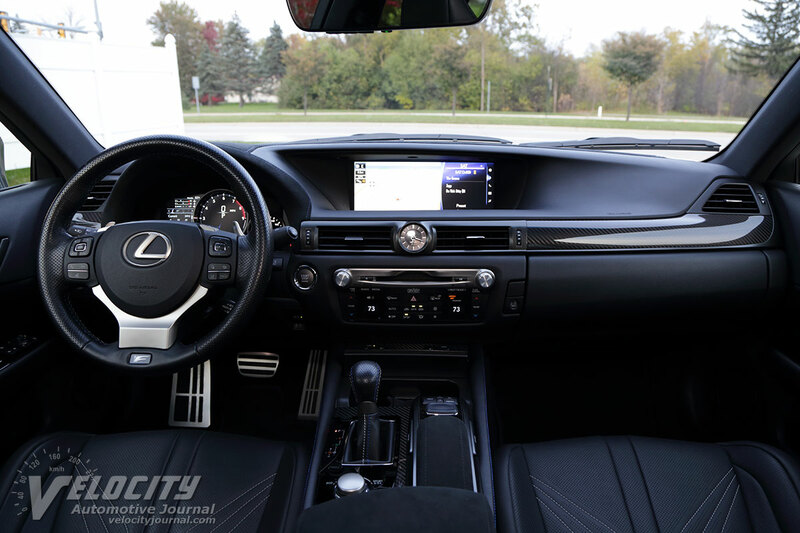 Inside the GS F, subtle styling changes differentiate this Lexus from other GS models. Firmly bolstered sport seats, carbon fiber accents, and Alcantara synthetic suede line the doors, armrest, and upper dash. 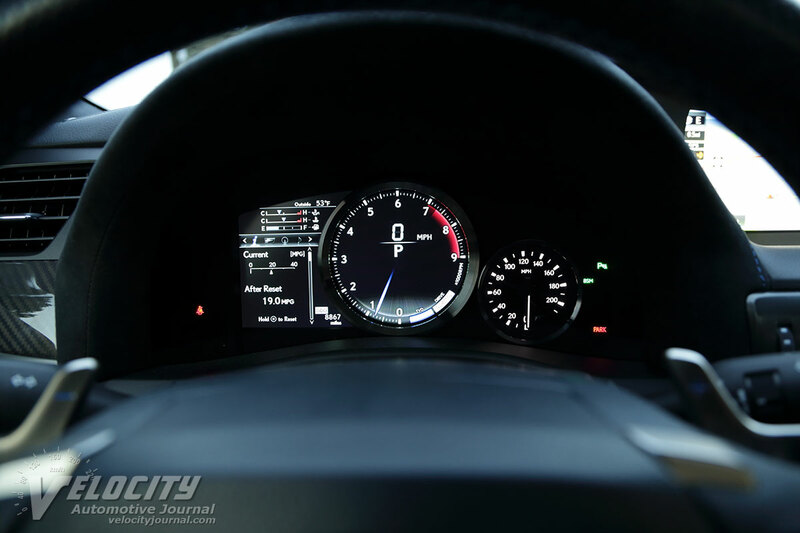 The instrument panel consists of a configurable LCD screen and an analog speedometer. On the perforated leather-wrapped steering wheel are integrated audio, phone, and cruise control functions. A rotary knob on the center console adjusts suspension damping, throttle response, and the instrument panel tachometer graphics. Other buttons on the center console change the TVD settings and enable a snow mode. Lexus continues to use its unique padded joystick controller for the infotainment system. We found the interface to be imprecise compared to a touchscreen, despite tactile feedback via the controller. 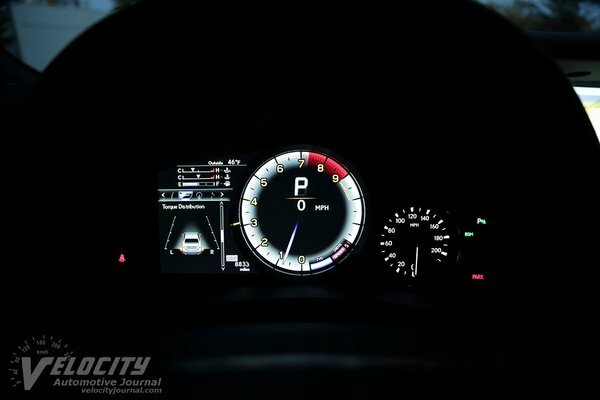 In contrast, the climate control system operates via clearly labeled buttons. Lexus did include rotary knobs for audio volume and tuning, plus buttons for frequently used audio settings. 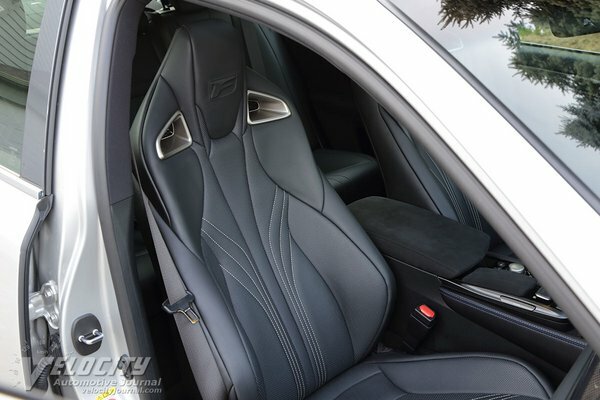 The heated and ventilated leather front seats offer superb comfort with excellent thigh and lumbar support. Both driver and front passenger get power seat adjustments: 10-way for the driver and 8-way for the passenger, including power lumbar support. Front headroom is adequate for occupants up to 6 ft. tall. 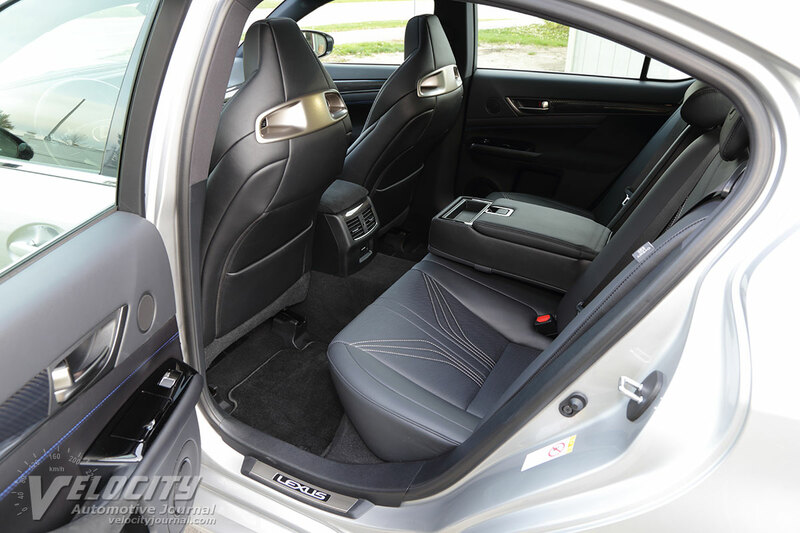 The rear seats offer excellent comfort and legroom for two passengers. Headroom is sufficient for 6 ft. tall occupants. 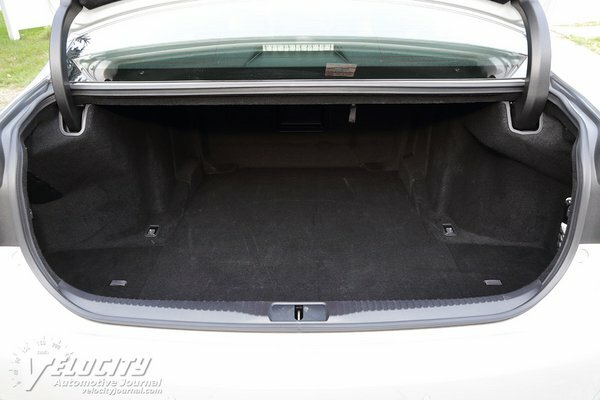 Although the rear seats will accommodate a third occupant, the center position is only tolerable for short trips. 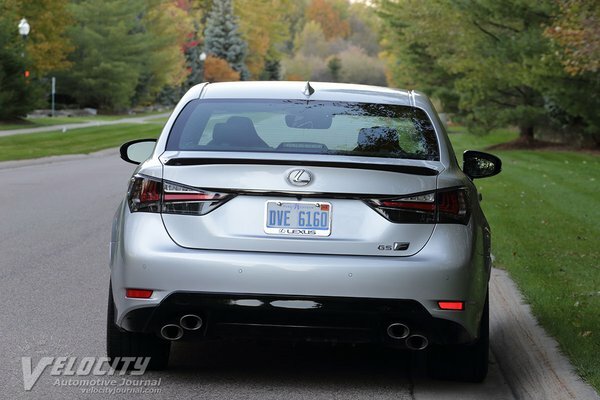 As we expected, the GS F is seriously quick. Rarely did we need to press the gas pedal past midway to rocket past any other cars for highway merging. Lexus engineers wisely dialed in linear throttle response to ensure a smooth launch from a stop. 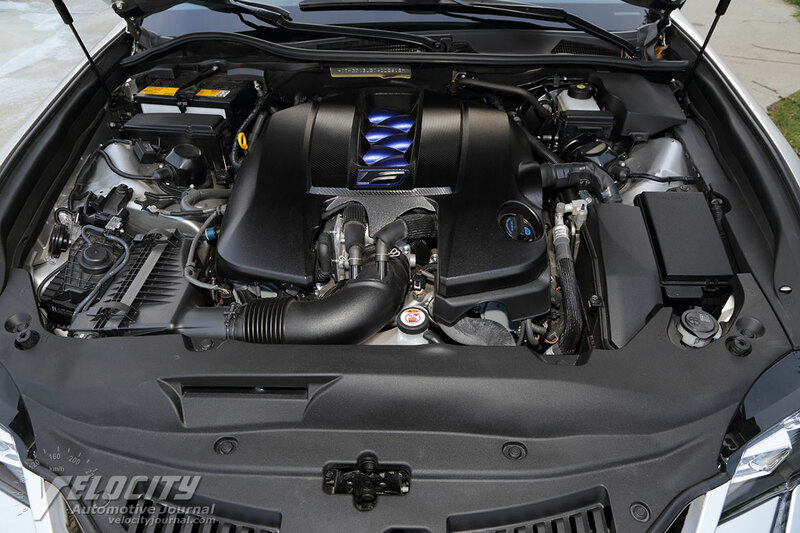 There is massive torque available everywhere in the rev range from this V-8. We were constantly holding back to keep from surging ahead of traffic. The temptation to mash the gas pedal was nearly overwhelming, just to hear the angry burble of the 5.0L V-8. At any normal highway speed, the GS F is supremely planted and stable. 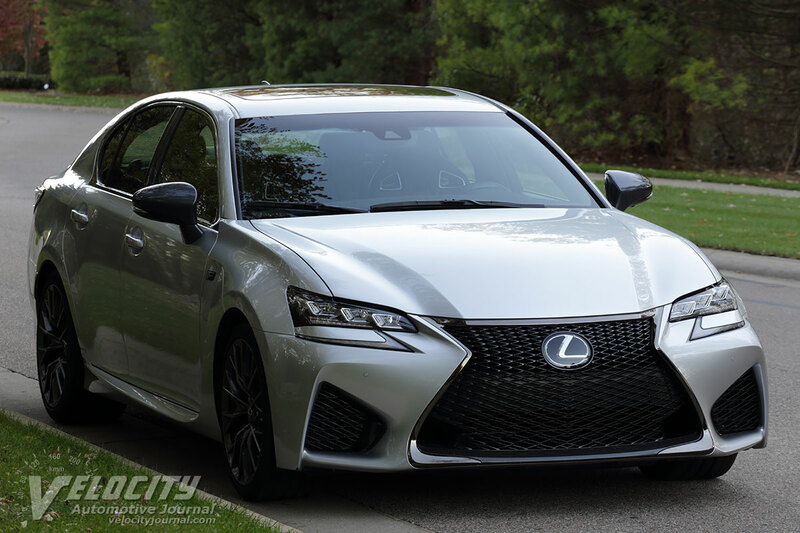 Wind and tire noise are minimal, but Lexus ensured that the V-8 is always audible in the background; at full throttle the engine note is amplified through the audio system if desired. 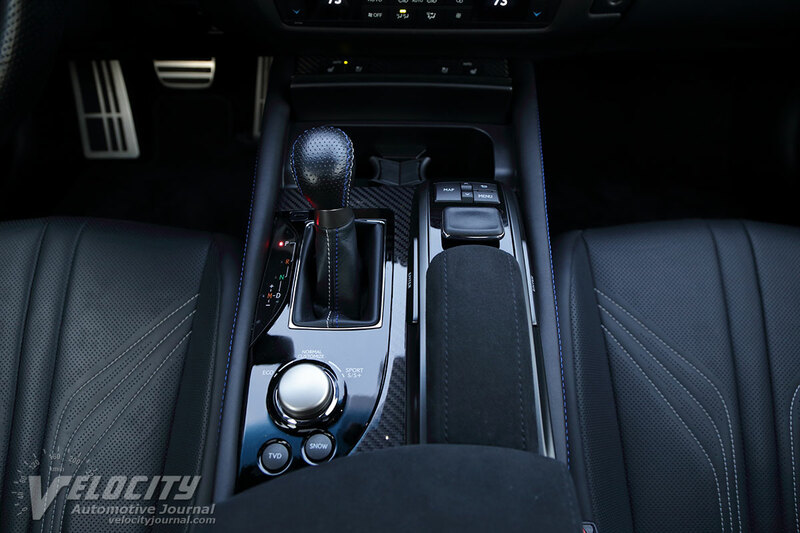 Lexus also modified the 8-speed automatic's shift programming (G AI-Shift) to use inputs from a g-force sensor and throttle position. Also, the transmission software blips the throttle to match revs during downshifts, and holds gears in the Sport and Sport+ modes for enhanced throttle response. Paddles on the steering wheel execute rapid gearchanges on demand, regardless of driving mode. 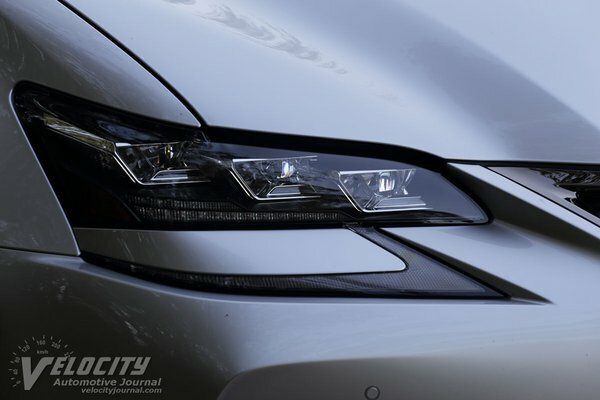 At night, the triple-LED headlights illuminated the road with an even beam pattern and exceptionally long range. Lexus tuned the GS F on race tracks, including the N�rburgring in Germany. Considering its 2-ton curb weight, the GS F drives like a smaller, lighter sedan. 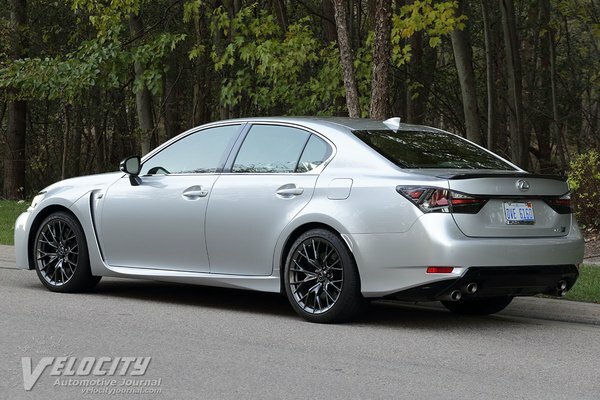 Mild understeer, communicative steering, and ample grip endows this Lexus with impressive dynamics. Body roll is kept to a minimum, but the tight damping and stiff stabilizer bars result in a firm ride that can get tiring on patched and potholed roads. On properly maintained pavement, the suspension soaks up minor bumps while maintaining chassis stability. Braking performance is impressive: the Brembos haul down the GS F rapidly from any speed; pedal feel is firm, without any compliance. The GS F is intended for the rare customer focused on a stealthy sport sedan with muscle car acceleration, yet able to cruise comfortably on an all-day road trip. 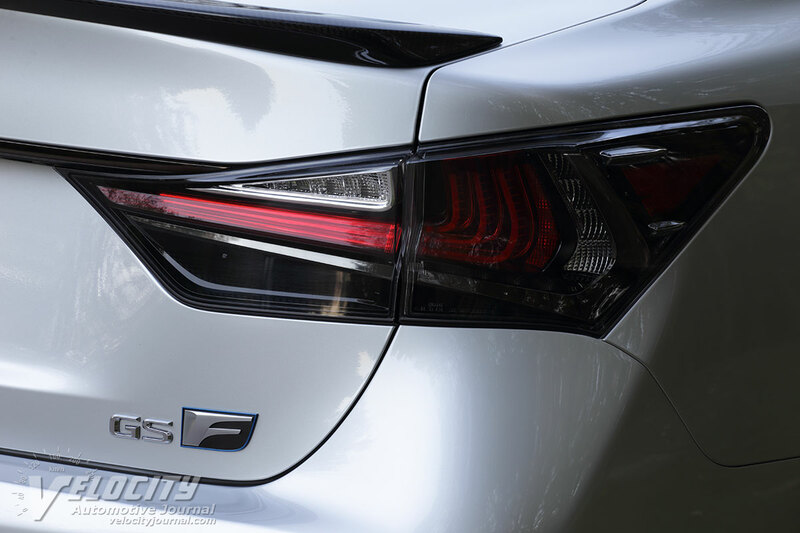 As the only Lexus sedan with a V-8, the GS F is also the most powerful 4-dr. in the lineup. Most GS customers will likely select the less expensive GS 350, but for the fortunate few who appreciate brawny V-8 performance, the GS F is your sedan.